Bangladesh needs major reforms in its tax and tariff scheme to stimulate growth and exports, a leading think-tank has said. 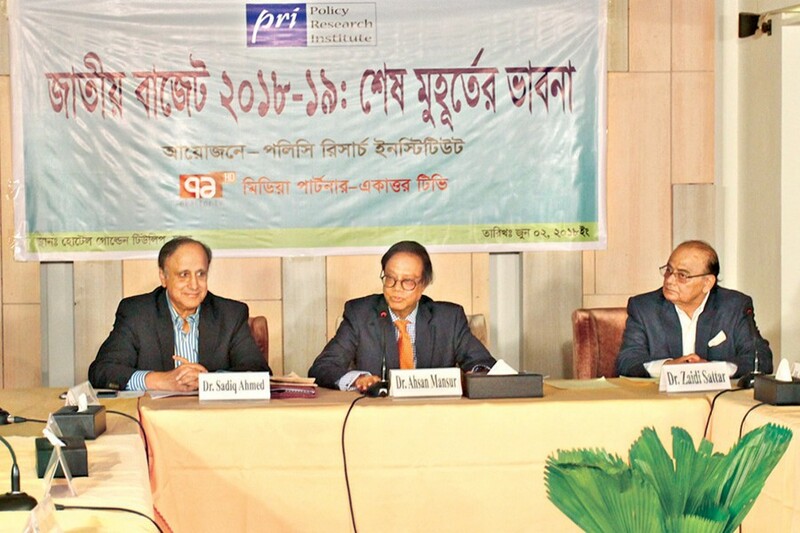 To speed up the reform, the government should move to establish a tax reform commission and introduce a uniform VAT system, said the Policy Research Institute of Bangladesh (PRI). The views came at pre-budget discussion organised at a city hotel on Saturday. "There has been no tax reform in the country for the last eight years. It is now absolutely necessary to modernise and simplify our tax system", said Dr. Sadiq Ahmed, vice chairman of the PRI. "In particular, there is a need for the rationalisation of the tax rate at the higher end and also at the lower end of the scale," he said. Experts noted Bangladesh's taxation to GDP ratio is still lower than those of other countries in the region. To raise this, they called for introducing a uniform VAT rate. "Introducing a uniform VAT rate will have a highly positive effect on the revenue flow", the PRI vice chairman said. "Although the tax rate in our country is quite high, the tax efficiency is quite low. This shows that there must be some incompatibilities", said PRI executive director Ahsan H Mansur. Against this backdrop, experts at the event called for forming a tax reform commission to analyse how much tax should be imposed on which sector and how much tax could be absorbed by the private sector. Experts at the event also called for reforming the tariff policy to make it more export and consumer friendly. "The price of consumer goods in the local market is almost 70 to 80 per cent higher due to protective tariffs", said Dr. Zaidi Sattar, chairman of the PRI. "During the last fiscal year alone, the local consumers had to pay Tk 120 thousand crore (Tk 1.2 trillion) taka more due to protective tariffs", he added. "Such protective tariff in the long term is neither good for industrialisation nor good for consumers", he said. "The present tariff policy is detrimental to both export growth and export diversification, Sattar said. Former commerce secretary Sohel Ahmed Chowdhury, in his speech, said that the National Board of Revenue alone formulates the tariff policy. The commerce ministry is never consulted on the issue, he added. The tariff policy is usually formulated in a haphazard manner; former chairman of NBR Abdul Majid said. For this, he called for more continuity and consistency in the formulation of such policy. The PRI chairman also warned about the declining export-GDP ratio in the country. "While the export-GDP ratio was in the double-digit back in the 1990s, it has decreased to single digit in last six years", he said. "To accelerate the GDP growth to 8.0 per cent, the export-GDP ratio should be increased to 13 per cent", Mr Sattar added. Warning about the volatile state of the banking sector in the country, experts at the event called for immediate formation of a banking reforms commission. Distinguished fellow of the Centre for Policy Dialogue Mustafizur Rahman called for forming a public expenditure review commission to monitor the progress in various major schemes coming under the annual budget. Urban planner Sarwar Jahan said that the key to solving the traffic congestion problem in Dhaka lies in introducing efficient rapid transit system including rapid bus system. "In recent years, we have built a lot of flyovers. Although, they are quite visible as mega projects, flyovers do little to decrease congestion", Professor Jahan said. Former president of the Dhaka Chamber of Commerce and Industry Asif Ibrahim called for establishing a National Infrastructure Development and Monitoring Advisory Authority under the public-private partnership model to monitor the progress of infrastructure projects. Speakers at the event were critical of the continuous subsidies on gas and electricity. Such subsidies are not benefiting the consumers, they said. "We don't want any subsidy on electricity because we the consumers are not getting any benefit of this subsidies", said Shamsul Alam of the Consumer Association of Bangladesh. He noted that the state-owned power companies are increasing their human resource cost despite incurring losses. He called for better monitoring of such increased cost. Speakers at the event also called for decreasing the areas of tax exemption and the introduction of carbon tax, while reviewing the property tax scheme.